Images of mothers fleeing with children from tear gas fired by American officers at the Mexican border were the focus of the news cycle earlier this week. The incident took place Sunday and resulted in children screaming and coughing amid the gas, and the wind carrying the chemicals toward people hundreds of feet away who were not attempting to enter the U.S., reported The Associated Press. Such violent, heinous and illegal acts against those legally seeking asylum is particularly ironic given that the story of the pilgrims is one of another migrant caravan that came to the U.S. for a better life, which we were reminded of not three days before. But that’s only part of the reason why the incident that took place Sunday highlights the hypocrisy of the nation, for the rhetoric that’s surrounding the caravan for the last couple of months has too. The statue of liberty does still read “Give me your tired, your poor, your huddled masses yearning to breathe free,” right? But beyond the famous poem that’s been quoted a number of times throughout the ongoing immigration reform debate, what’s more hypocritical is that the U.S. is also a nation that claims to adhere to Christian values. Shouldn’t American Christians therefore be the first to speak up for the stranger, the refugee? 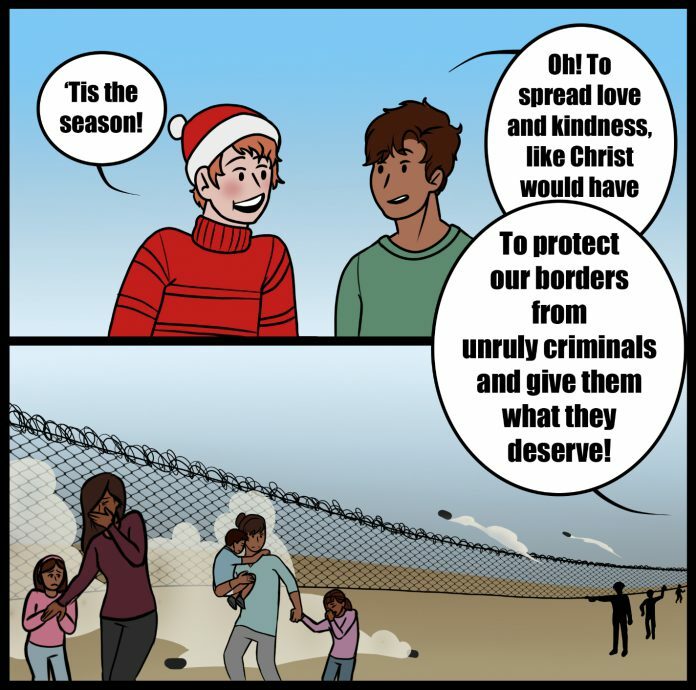 Instead Christians, especially white Evangelical Christians, are often the ones perpetuating the hateful rhetoric regarding immigrants of all nationalities and religions. This says a great deal about the substance, quality and meaning of their purported faith. Is it possible to love God while hating one’s neighbors? The Bible repeatedly says it’s not. It also relentlessly commands Christians to be generous, hospitable and just to strangers, aliens and refugees. But alas, tear gas is thrown and five thousand troops are sent to the border to block the caravan and the majority of the Christians and descendants of immigrants are silent. Well those that aren’t “liberal snowflakes” that is. When did caring about our fellow humans become a liberal view? Shouldn’t all of humanity share that view except for maybe the sociopaths? Now, the U.S. of course can’t take in all the world’s most vulnerable, and our elected officials have a responsibility to keep us safe and set reasonable limits, but surely the wealthiest and freest nation in the history of the world can take in more than we do. Especially during a time of such massive displacement of people, which, according to the United Nations, amounted to 65.8 million at the end of 2017. People are fleeing due to civil war, unrest, violence, corrupt governments and religious persecution, much like the pilgrims faced before fleeing on the Mayflower. Much like many others have over the course of U.S. history. Everyone agrees the U.S.’s immigraton system is broken and needs to be fixed, but to paint immigrants as a threat to democracy and perpetuate the lie that those seeking asylum — a legal act— are criminals is not the way to go. The nation’s leaders and citizens must have the courage to reject the politics of fear and division and face all of this hypocrisy head on. Surely a balance between security and compassion exists, we just have to find it.